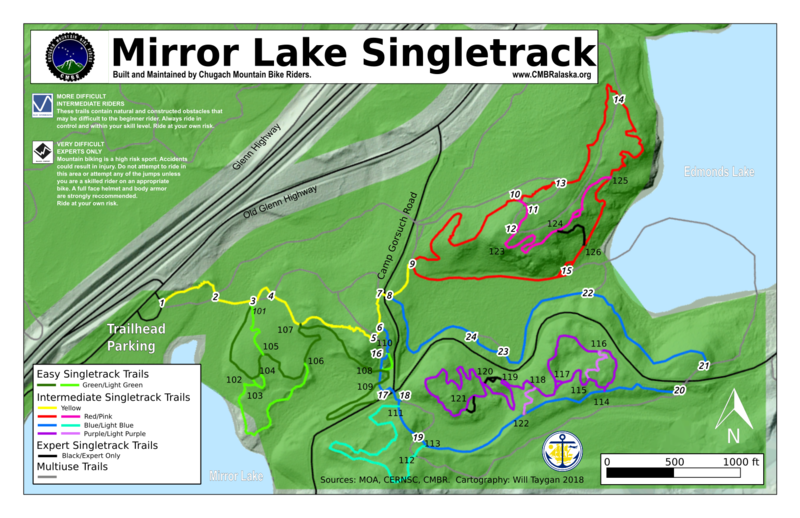 The Mirror Lake Singletrack consists of five miles of preferred-use mountain bike trails. Trails are two-way unless otherwise designated. Please yield to uphill riders. We recommend riding with a bell for safety. The new Green area has one mile of easier trails, while a few short expert-only black-diamond trails are found deeper in the trail system. Pink/Off-CMBR offers a one-way rollable jump line. The remaining trails are mostly intermediate flow trails with primitive and technical sections. Main routes are the darker colored segments, with alternate routes in lighter colors. Phase 1 (Yellow, Red and Blue Trails) opened June 2017. Phase 2 (Green, Light Green, Pink, Purple, Light Blue and Black Trails) opened October 2018. Multiuse Trails (in gray) are also open to biking, though some sections are accessible only when frozen. Be a part of the Singletrack community! Your donation will go directly to our all-volunteer organization to maintain and improve your local mountain bike trails.